In base of pressure cooker, sauté garlic (whole cloves), onion and green pepper in extra virgin olive oil over low heat. Add bay leaves and green chilli. Add flesh of ‘choricero’ pepper, stir and cook on low heat for 2 minutes. Salt to taste. shouldn’t take too long. Overall some 30min. 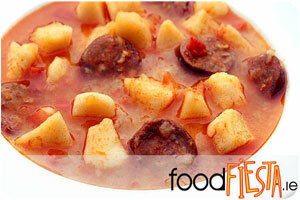 Does the Rioja Style Potatoes – Patatas a la Riojana recipe have to be made with a pressure cooker? I don’t have one and really don’t even know how to use one. Thanks in advance!